2015 was a record year for the the People's Liberation Army Navy (PLAN or Chinese Navy) in terms of new vessels procurement. No less than 3 destroyers, 4 frigates and 5 corvettes were commissioned into the Chinese fleet. Let's take a look back at the impressive number of units that joined the PLAN's fleet last year. Type 052D Destroyer Hefei (174) was commissioned on December 12th 2015 according to the PLAN. Type 054A Frigate "Huanggang" (hull number 577), the seventeenth vessel of the class during the commissioning ceremony. Vessel 868 is seen transporting a Zubr class (Project 12322) LCAC in this official picture from the shipyard in charge of the building the vessel. PLAN Naval Aviation Y-8FQ Cub/High New 6 (GX-6) Maritime Patrol Aircraft entered operational service with the North Sea fleet in 2015. 2015 saw some Chinese naval aviation developments as well, with the new induction of the new GX-6 Maritime Patrol Aircraft (MPA) with the 2nd Naval Aviation Division 6th Regiment based in Dalian. The Anti-Submarine Warfare (ASW) variant of Y-8, the Y-8FQ Cub (also known as GX-6 for High New 6) first surfaced on the Chinese internet in November 2011. 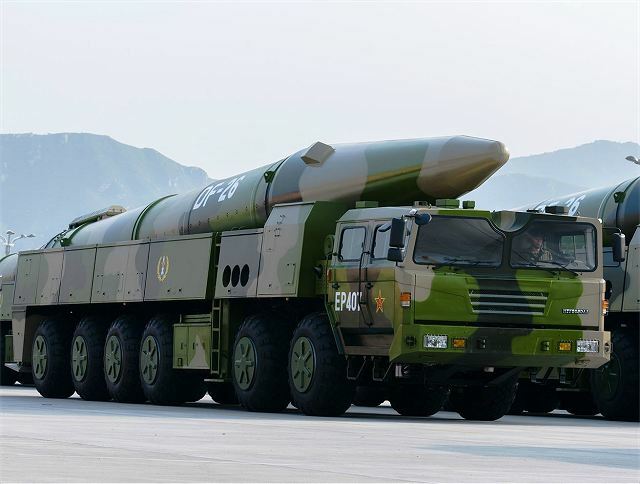 While not operated by PLAN, the DF-21D and DF-26 Anti Ship Ballistic Missiles were two important systems showcased during the military parade of September 3, 2015 in Beijing. The DF-26 is a medium-to-long-range ballistic missile. The DF-26, based on the DF-21, is nicknamed the “Guam Killer” as its range of about 3,500-4,000 km is roughly the distance required for China to take out the US island territory and strategic naval base. China's Defense Ministry Confirmed the Construction of an Aircraft Carrier Type 001A for PLAN on December 31st 2015. What's next for 2016 ? » The PLAN already commissioned a new Type 054A Frigate (532 Jingzhou) on January 5th 2016. The PLAN could order more on top of the 24 already ordered. A new full electric propulsion variant designated Type 054B could appear. 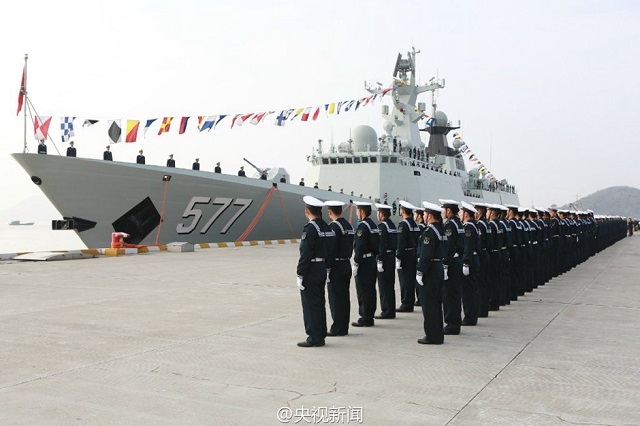 » Commissioning of several more Type 052D Destroyers. » Launch of the Type 001A Aircraft Carrier is expected by some for the Summer. » First steel cutting for China's third Aircraft Carrier, Type 002, may happen this year at Changxing Jiangnan shipyard in Shanghai. » The keel laying for PLAN's next generation 12,000 tons Destroyer, the Type 055 at Changxing Jiangnan shipyard in Shanghai. » The keel laying of probably two additional Type 071A LPDs. » The first steel cut of PLAN's first LHD, the Type 075, at Hudong shipyard. » Launch of the second Type 901 fleet replenishment oiler. 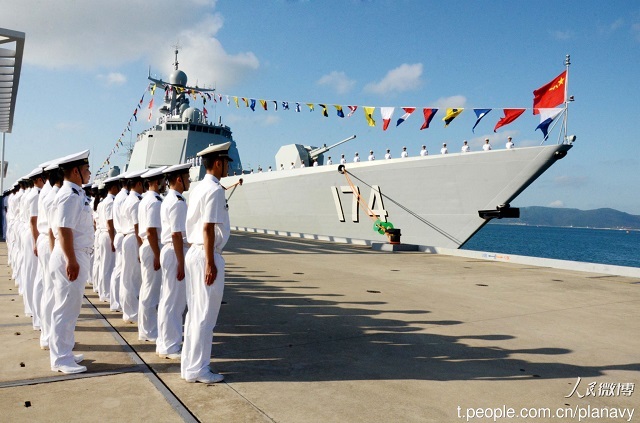 » Commissioning of additional Type 056/056A Corvettes (up to 64 have been ordered by the PLAN). » Construction of additional Type 636A Hydrographic Survey Ships, Type 815A Electronic Surveillance Ships and/or Type 903A Replenishment Oilers. » Construction of additional Type 09IIIA and Type 09IIIB SSNs and Type 039C SSKs.